From the Dayton Daily News (Dayton, Ohio), Aug. 18, 1985. Before the internet, there was your local newspaper, a spigot of knowledge compared to today’s avalanche of web data. 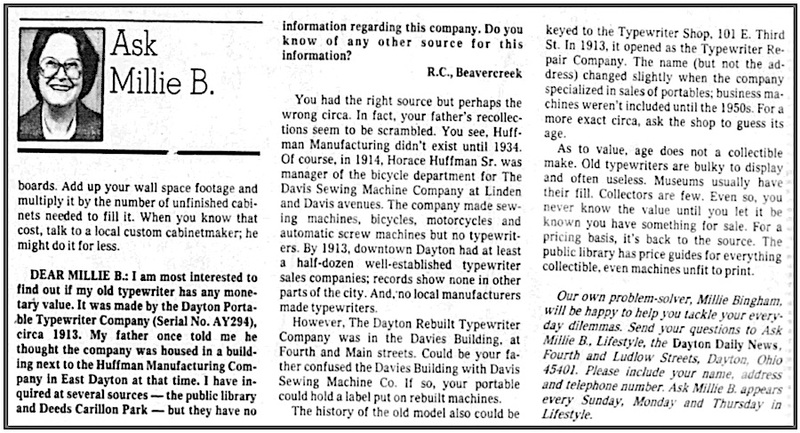 The “Ask Millie B.” column above offers no real information about the Dayton Portable Typewriter, but it does provide a new serial number for surviving machines: AY294, for a portable owned by “R.C.” of Beavercreek back in 1985. (The prefix is likely misstated, as AX for greenish machines and BN for black machines are the known prefixes.) This marks the 9th noted Dayton. The Dayton Portable Typewriter was introduced in 1924, and most surviving machines originate from either Dayton, Ohio, or Pittsburgh, Pennsylvania, two places the company held operations. Ted Munk lists seven machines in this blog post, and I mention an eighth machine here. Interesting newspaper column. I still read the newspapers and magazines. Just something missing only reading the internet. Yes, I deeply miss newspapers — I read the New York Times and Washington Post on my tablet — but I simply can’t afford a print subscription. Such is our age! Still, none higher than 372 yet.. Boy, Millie really pitched some cold water on the owner of this very rare typewriter. I hope it wasn’t scrapped. This is still a neglected, underestimated typewriter; I got mine (from a well-known auction house) for nearly nothing. I sure would like to count #294 among the survivors, but who knows. It would be interesting to know if some 372+ machines were manufactured. Advertising for the Dayton was limited, and it appears they were made as needed. Scientifically, what does a ratio of 8 (or 9) surviving machines mean to the actual production volume? I reflect on the volume of surviving machines for the Molle No. 3 or the Remington 3B, but it is difficult to surmise a number for the Dayton. Accepting 372 as an actual number, there are more surviving Daytons, percentage-wise, than Molles (upwards of 70) or 3bs (a few dozen?) within their own lines.